There are many brands of strings using different materials available to purchase. The only way to fully understand every string is to play with each one to determine what sounds the best for you and your instrument, but that is not a reasonable quest to venture into considering the amount of choices out on the market. Every string has its own characteristics that can change the tone, volume, and responsiveness of the instrument. For much of the history of classical stringed instruments, makers used the intestines of animals as strings for their instruments. Contrary to popular belief most strings were made from sheep gut, and not cat gut. Metal strings did not come to be commonly used until about a century ago. Even more recently companies have begun to produce synthetic strings usually made with some form of nylon for its core. Whether the strings are gut, metal, or synthetic they are usually wrapped with some sort of metal. These metals vary between aluminum, silver, tungsten, copper, gold, titanium, and platinum. We use the word gauge to describe the thickness of strings that directly correlates with the tension, or the amount of weight the string pulls onto the instrument. Strings can come in different gauges. Lighter/thinner gauges will have a lower tension while thicker strings will have higher tension. Strings with a lower tension will usually be thinner, more responsive, and can brighten the tone of the instrument, while higher tension strings will give a louder, and a more powerful sound, but may result in a "dead" sound if the tension is too high for that particular instrument. This is not concrete, and can be different depending on your individual instrument. Most musicians will stick with a medium gauge string especially when starting out. Describing sounds is very difficult. Terms like bright, warm, clean, and complex are often used to describe tone or timbre. Here is a simple analogy to get an understanding of the difference between a bright tone and a warm tone: Imagine striking a thin piece of metal with a hammer. That more shrill, thin sound could be called bright. Now imagine striking a block of wood with a hammer. That sound would be more warm, or dark. Understanding and Explaining the difference between clean and complex tones is a bit more difficult. That difference in tone has to do with the number of overtones within the sound produced. Overtones are vibrations that are part of the harmonic series, or multiples of the same frequency that sound at the same time. Clean tones produce less overtones while complex tones produce more overtones. Every instrument is different, and strings will not sound the same on every instrument. Although a new string may alter the tone of an instrument slightly, it is only one factor in the total sound of an instrument. Gut strings are usually made from sheep intestines. The majority of the strings are wound with a metal, but some are available unwrapped. Gut strings are warmer in tone, and have a more complex sound. They are lower in tension which makes them feel softer, but they are also less responsive. These are great for musicians playing Baroque or Classical style music. Gut strings are typically more expensive then synthetic strings, and they are not very pitch stable. They can take up to two weeks to settle in, and are easily influenced by temperature changes. Beginners should stay away. Many classical musicians will only use gut strings because of their warm tone for a more traditional sound. Synthetic strings have a core made of a material that is neither gut nor metal. There are different types of materials that are used in synthetic strings. Many of the synthetic strings have a core of perlon which is a type of nylon. Synthetic core strings are similar to gut strings in that they can have a warmer tone, but they stay in tune much more easily, and settle in within days instead of weeks. 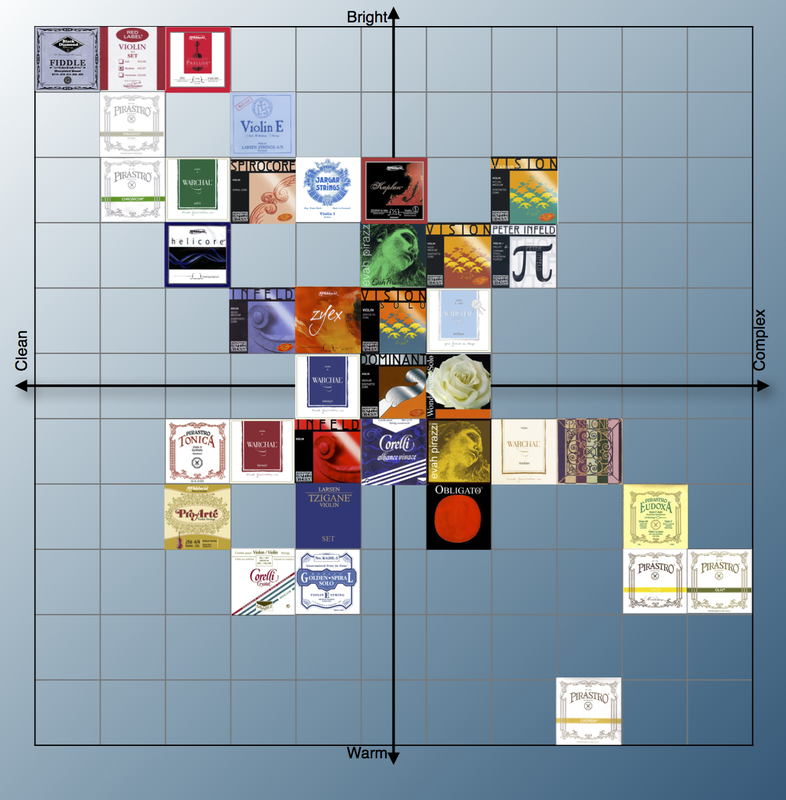 Synthetic strings are the most popular type of string for string players today. These strings usually have a steel core. Some will have just a solid strand, while others will be multiple smaller strands in the core. These are great for beginning students because they are very pitch stable, not effected much by temperature changes, and are quite durable. Metal core strings are much brighter than both gut and synthetic core strings. These strings are very common among fiddle players, electric instruments, and other contemporary music styles. Most student instruments are strung with metal strings because they are cheap and durable. If you need help identifying a string please check out the color reference chart.